Essentials of Teaching Adapted Physical Education: Diversity, Culture, and Inclusion offers a wealth of knowledge for teaching today's diverse student population, including those with disabilities. Readers will learn how to teach a variety of students, organize learning within various curricular models, assess and evaluate students, and manage behavior. Readers will also learn more about the conditions and disabilities they may encounter when teaching, how to understand students' various abilities, and how to adapt and modify instructional methods to include all students. The book emphasizes the importance of being culturally responsive and acquiring the necessary knowledge to infuse appropriate, socially just practices into educational settings. Future teachers will learn how to apply culturally responsive instructional methods and behavior management strategies and will understand broader social and economic contexts for their students' behavior. 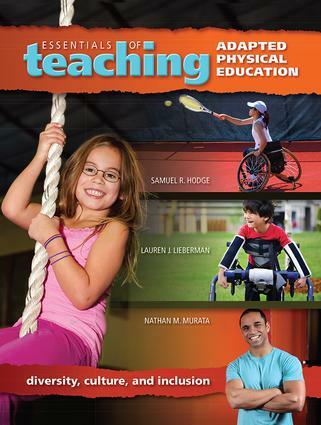 At the same time, this book provides more than a how-to approach to teaching adapted physical education. Its content and features promote reflective learning, encouraging readers to anticipate the types of teaching situations and challenges that may arise and think through how they will respond. Scenarios and vignettes throughout provide context for the material and promote critical thinking and problem solving. Samuel R. Hodge is a professor in the College of Education and Human Ecology at The Ohio State University, US. He has a dual master's degree in adapted PE and motor behaviors and a doctoral degree in adapted physical education and sport pedagogy. His scholarship is focused primarily on issues pertinent to teacher education and inclusion, preparing teachers to offer adapted PE for diverse students with disabilities, and social justice in education and sports. Service-based interests include leading diversity recruitment and retention programs at The Ohio State University. He has numerous publications to his credit. In 2013 Hodge received the APAC Professional Recognition Award, in recognition of his significant contribution to scholarly publications in adapted physical education, the significant mark he has had made on the lives of others, and his enhancement of the image of people with disabilities in society. Lauren J. Lieberman is a professor in the Department of Kinesiology, Sport Studies and Physical Education at the College at Brockport, SUNY, US. Her scholarship focus is on inclusion strategies as well as teaching children with sensory impairments. Moreover, her research and service-based interests (e.g., Camp Abilities, a developmental sports camp for children who are blind) involve strategies and programming for working with children who are blind, deaf, or deaf-blind in physical education, sport, and recreation contexts. Dr. Lieberman is also nationally recognized for her research scholarship in peer-tutoring strategies to facilitate inclusion in general physical education classes, and she is the author of multiple publications. In 2012 Lieberman received the APAC Professional Recognition Award, in recognition of her significant contribution to scholarly publications in adapted physical education, the significant mark she has had made on the lives of others, and her enhancement of the image of people with disabilities in society. Nathan M. Murata is a professor in the Department of Kinesiology and Leisure Science at the University of Hawaii at Manoa, US. He has expertise in both adapted physical education and teacher preparation, and he is a nationally certified adapted physical education professional. In addition to receiving his Bachelor of Education in Secondary Physical Education and his Master of Education, Secondary Education from University of Hawaii at Manoa, Murata received a special education teacher certificate with an emphasis in mild/moderate disabilities and completed a Transition Specialist program, both at UH Manoa. His research foci have included pedagogy for students with disabilities, training support personnel to work in inclusive environments, attitudinal variables regarding the inclusion of students with disabilities in general physical education, and aquatics for individuals with physical disabilities. He is also a principal investigator for the Office of Special Education Programs, Personnel Preparation grant.